Info "Flop the fish but avoid the rock!" Out of Water is a WarioWare: D.I.Y. Showcase microgame, appearing in Kat and Ana's stage. 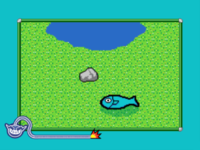 The game involves a fish flopping around out of the water. A lagoon and a stone are near the animal. The objective is to tap the fish, and guide it back to the water. However, if the player touches the fish when it is in front of the stone, the fish hits it and they lose. This page was last edited on October 8, 2018, at 22:23.